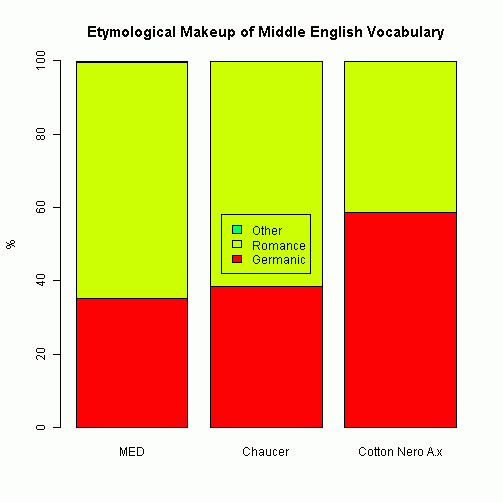 The tendency for editors to remove the letter thorn in modern editions of Chaucer is quite different from the way other Middle English texts are treated. The poem Sir Gawain and the Green Knight, for instance, written by a contemporary of Chaucer's, is edited with its letters thorn and yogh left intact. This difference in editorial policy is perhaps a reflection of different attitudes to the two authors. Because Chaucer is seen as central to the English literary canon, there is a tendency to present his works as more 'modern', thereby accentuating the myth of an unbroken, linear tradition. The anonymous poet who wrote Sir Gawain and the Green Knight, using a western dialect and the old-fashioned alliterative metrical form, is further cut off from the literary canon by presenting his text in authentic Middle English spelling. There is every reason to look upon the types one the good man and one the best man as natural outgrowths of the organic structural pattern of native linguistic usage. They offer striking parallels to the common OE type min se leofa (leofesta) freond. The characteristic feature in constructions of this kind is the isolation of an attribute or other defining word from the noun or noun-group by means of an intervening element (called a Gelenkspartikel and particule d'articulation by German and French Romance scholars). This isolation has the effect of bringing out into relief the idea expressed by the attribute, i.e., of making this word and the whole group more emphatic. This peculiar rhythmic arrangement, which probably has counterparts in most languages of the world, is responsible for such common types as all the world, both the(se) boys, half a bottle, too long a story, what a night, etc. 8. To choose or take one's way; ~ wei (gate); proceed or go (to or from a place); refl. betake oneself; ~ fast, to hurry. 9. (a) To perceive (sth., sb. ); also, recognize; (b) to distinguish (one thing from another). ・ Duggan, H. N. "Meter, Stanza, Vocabulary, Dialect". Chapter 8 of A Companion to the Gawain-Poet. Ed. Derek Brewer and Jonathan Gibson. Cambridge: Brewer, 1997. 221--42. ・ Hinton, Norman "The Language of the Gawain-Poems." Arthurian Interpretations 2 (1987): 83--94.